Herm Johnson, who had two starts in the Indianapolis 500 and placed within the first ten both times, succumbed on Saturday, December 10, 2016 to liver and renal failure. He was 63. A lifelong resident of Eau Claire, Wisconsin, Herm placed ninth in the 1982 “500” and eighth in 1984, sponsorship coming from a family friend, John Menard, who just happened to live across the street. The sponsorship in those days was from the Menard Cashway Lumber Company. Herm was a Sports Car Club of America road racer who won SCCA’s 1976 Super-Vee championship “runoffs,” held that year at Road Atlanta. 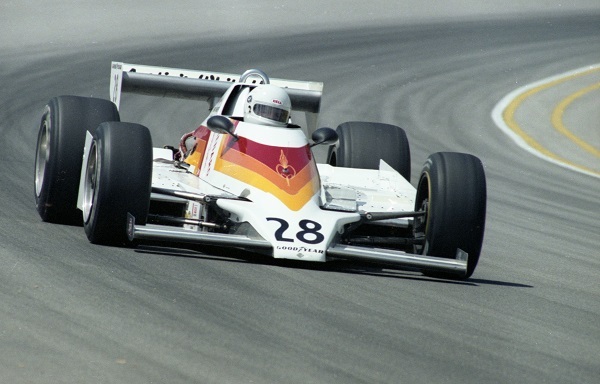 In 1977, he and Tom Bagley were joint champions of the inaugural United States Auto Club-sanctioned Mini-Indy series for the Robert W. Bosch cup, a four-race start-up series for Super-Vee cars on oval tracks. This was the series, which for the next several years was to produce such Indianapolis regulars as Josele Garza, Geoff Brabham, Howdy Holmes, Pete Halsmer, Dennis Firestone, Michael Chandler and others, in addition to Bagley and Johnson. Herm had a total of 36 IndyCar starts between 1979 and 1985, scoring nine top-ten finishes, topped by a sixth-place finish at the one-and-a-half-mile Atlanta International Raceway in 1982. Herm’s tenure at Indianapolis lasted from 1980 until 1986, but resulted in just the two starts, a last-minute “bump” to first alternate starting position in 1981, and engine problems sidelining him in 1983, before accidents, both resulting in injury in 1985 and 1986, brought his driving career to a close. A very soft spoken and gentle individual, Herm was able to parlay his talents as an artist into a sideline, painting helmets for other drivers. He also willingly returned to IMS each year, including just this past May, to sign autographs for the fans on the day before the “500,” along with many of his colleagues. What a delight it was to see him sitting off in a corner and reminiscing with his old Mini-Indy buddies like Bagley, Alsup, Brabham, Garza, Halsmer, Chandler and others.